Salzburg Day Tour from Munich operates on Tuesdays, Thursdays, Saturdays, and Sundays from January to March, and daily from the last week of March to December. The tour will depart at 9.15 am. We are comparing Salzburg Day Tour from Munich Prices from leading ticket suppliers and Try to find you Cheap tickets prices on the market. From the homeland of the Oktoberfest to the birthplace of Mozart and the much-loved ‘Sound Of Music', this tour will take you away from the former Nazi buildings and monumental squares of Munich to the beautiful Austrian city of Salzburg. And, this day trip is not all about Julie Andrews and her gaggle of children, although you will see many of the locations used to film the musical, including the same park where ‘Maria' taught us all how to sing ‘Doe-ray-me'. During a 1.5-hour orientation tour of the city your knowledgeable guide will show you through the heart of Salzburg, pausing at points of interests, like the Domkirke Cathedral and the home and local haunts frequented by the great Mozart, whilst recommending places to see, eat, and visit while in the city. You'll have 3 hours to explore Salzburg independently, stroll through the Mirabella Gardens, admire the 900-year old Festung Hohensalzburg which sits high above the city, and stop to eat in the oldest restaurant on the continent. Salzburg is also known for its mediaeval old town, one of the best preserved in Europe, so take some time to explore its winding streets. You will travel by train from Munich with a local guide and a group of up to 25 people. The journey is 2 hours each way through gorgeous mountain scenery. This tour is perfect for first-time visitors to Europe, who will have the chance to see both a Geman and Austrian city in one day, without the hassle of arranging their own transport. Also ideal anyone wanting to visit the home of ‘The Sound of Music'. This small group tour is suitable for couples, individuals, families, and wheelchair users. Your Experience With Salzburg Day Tour from Munich? Take a day out of Germany to discover the wonders of Salzburg, Austria. Explore the hometown of one of the worlds most famous classical musicians, Wolfgang Amadeus Mozart. Get to know the city on a 1.5 hour guided tour of the city centre. Visit the real places where the Sound of Music was filmed and discover the streets of the UNESCO protected old town. Admire Austrian architecture, mediaeval fortresses, and the famous Domkirche Cathedral as well as other city landmarks. 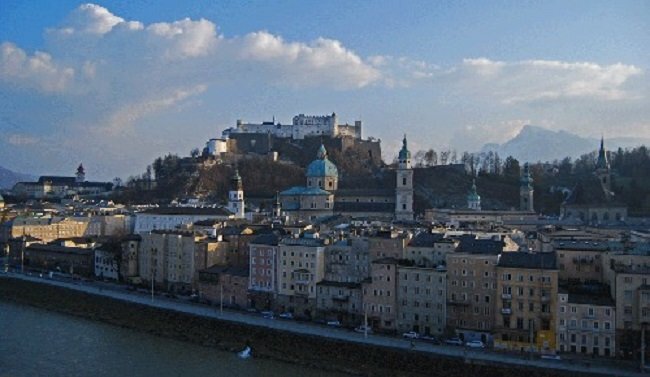 What Salzburg Day Tour from Munich Includes? Return transportation by train from Central Munich. Central Munich – travel to Salzburg by train – 1.5-hour tour of the city and free time in Salzburg – return trip to Central Munich. This tour is operated by Radius City Tours; the company operate many tours within the city and surrounding area may offer discounted rated if booking multiple tours. Travelers Reviews about Salzburg Day Tour from Munich? The Salzburg Day Tour from Munich is operated by Radius Tours, a reputable local company based in Munich, and the excursion has earnt 5-star reviews from TripAdvisor and Viator users. Travellers say that this a well-organised tour led by excellent guides who are fluent in English. There do not seem to be any negative comments, instead, travellers agree that the transport by train is pleasant and that there is enough time in the city of Salzburg. Please advise your tour provider in advance. Tickets will be sent via email immediately after purchase. Please bring your mobile or printed ticket. All tickets are refundable up to 48 hours in advance of scheduled tour, however if you have made your booking with Viator then cancellations should be made at least 7 days in advance in order to receive a full refund. Please be at the meeting point at least 15 minutes in advance. You will need to bring your valid passport (or European international ID card), in case of inspections when crossing borders. This tour is available in Spanish or English and may be conducted in both languages. Please wear comfortable walking shoes and appropriate clothing for the weather. Meeting Point: meet your guide at the Radius City Tours Office in Munich Central Station, Hauptbahnhof, located opposite tracks 32-34. I like to read such helpful posts so that I can care myself. You have lots of good blog ideas which are created in a very good way to the readers. I like the content ideas you have prepared. You have chosen good topics which are very good.